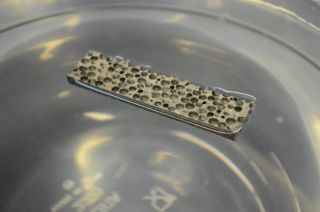 Strong, lightweight materials are the holy grail for materials scientists, but the bar has just been raised with the discovery of a metal matrix composite so light that it can float on water. It's made of a foam of magnesium alloy reinforced with silicon carbide hollow particles. That gives its a density of 0.92 grams per cubic centimetre, compared to 1.0 for water, allowing it to bob to the surface when submerged. That light weight wouldn't be much good, however, if it wasn't also strong - the marine environment is not a gentle one. Impressively, the interior bubbles can withstand a pressure of more than 25,000 PSI before they break - about a hundred times the pressure of a firehose. Not only that, but the bubbles act as an energy absorber for the material, offering direct impact protection. It can be customised by adding more or fewer bubbles to increase or decrease the density and other properties. "This new development of very light metal matrix composites can swing the pendulum back in favor of metallic materials," said Nikhil Gupta, the study's co-author. "The ability of metals to withstand higher temperatures can be a huge advantage for these composites in engine and exhaust components, quite apart from structural parts." The material could be put into prototypes for testing within three years, and its details were published in the International Journal of Impact Engineering.